If you believe tech startups, the roads of the future will be dominated by joyless, featureless boxy self-driving pods. When alone in a sea of interesting human-driven cars these things can look futuristic and space-y, but when they are all gathered together, you quickly begin to feel like you’re in the toaster section of Walmart. In the now-immortal words of Marie Kondo, these self-driving pods do not spark joy. 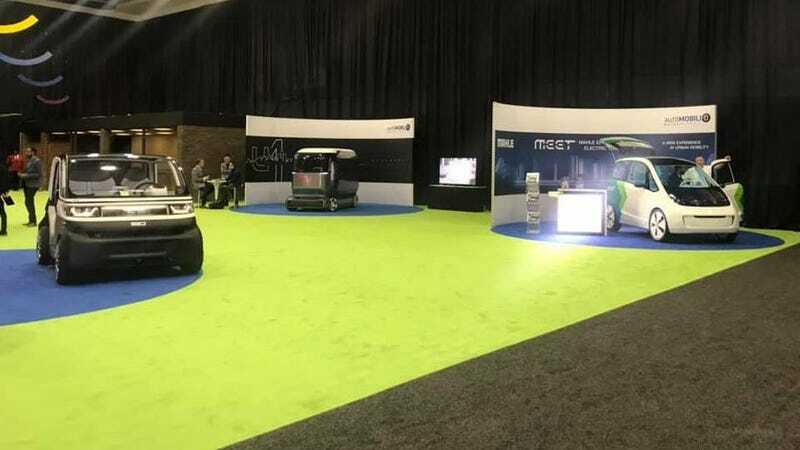 It’s not just the self-driving start ups; The big guys brought eerily similar electric concepts to the 2019 Dertoit Auto Show as well. It makes no sense to me—you are redesigning transit and, essentially, our way of life! Why make it so boring and repetitive? But does that mean we should throw them in the dustbin of history and move on to bigger, better, more interesting ideas? Maybe! Other automakers are being more conservative when it comes to their self-driving timeline, but these pod makers are aiming for the stars with their technology, if not their design. Let’s take a moment to examine the boxy mobiles on offer at the auto show. Come and gaze into the abyss that is our future with me, won’t you? If you’re going to make a self-driving pod, you must make it square and give it a lot of pointless lights to really drive home the fact that this is travel for and from the future. The Rinspeed Snap came out last year’s Consumer Electronics Show, with this mini version making its debut earlier this year. Admittedly, the bigger version is less toaster-like, but that’s not what the company brought to Detroit. This particular concept is the Rinspeed Microsnap, a smaller version of the larger self-driving, mobile space concept. While this one does have the neat option to separate from its skateboard it is still very much a grey brick. And that’s sad. Rinspeed is the company that gave us the sporty iChange concept and the the Bamboo concept. But even this company that was once devoted to the strange and unusual is being sucked into this inexplicable and boring trend. If it’s not a grey brick, it’s a little white pod! Mahle’s Efficient Electric Transport, or MEET, is a purely electric vehicle aimed at urbanites. It comes with two 48-volt electric motors and imagines itself (in its press materials at least) as being small, but extremely comfortable. There are even separate climate control systems for the passenger and driver. Why this would matter in a vehicle the size of a Tim Horton’s booth is beyond me. It’s electric! It’s modular! It’s autonomous! It’s all of the things that make “mobility” great. It’s also another grey brick. This one is on offer from Quadrobot and looks a little more evil than the other concepts. It might be the lack of jazzy lighting. Maybe Quadrobot should take a page from the more cheerfully highlighted Rinspeed. Anyway, these vehicles are meant to assist with that pesky problem of last-mile delivery. Delivery trucks currently clog up city streets trying to get packages to their final destination. This concept is suppose to alleviate that traffic somehow through direct delivery. How multiple self-driving buggies rolling around will help fight traffic congestion is anyone’s guess. This cute little guy even has a cute little name: Sven. From the global company FEV, Sven is an electric urban vehicle with the ability to park anywhere and emit no noxious gases while doing it. This glorified golf cart is also an all-electric self-driving concept covered with LiDAR and sensors. An FEV spokesperson told me that Sven will be ready for level four autonomy by Q3 of 2021, but please avoid holding your breath until then. It may be a long time before we see any of these boring little urban crawlers on the street. It’s a good thing these vehicles can drive themselves because if this is what our future will look like, we’ll all be asleep at the wheel in no time. At least we’ll be well rested.